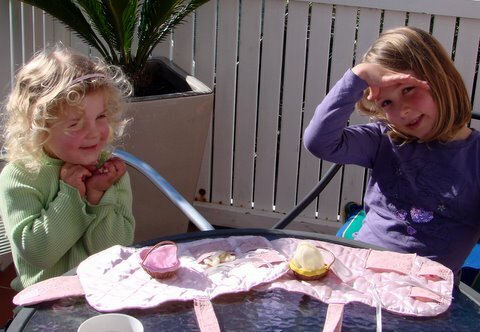 I bought my daughters some tiny dolls the other day as a little treat for being so good all week. They begged for the carrier that went with them but there was no way I was going to pay the nearly $30 for each bag when I knew I could make something similar at home. 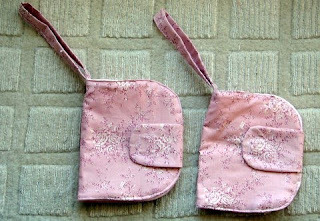 I took photos while I made the little dolly carriers so you can make one too. The bag is more like a little folder with pockets inside. 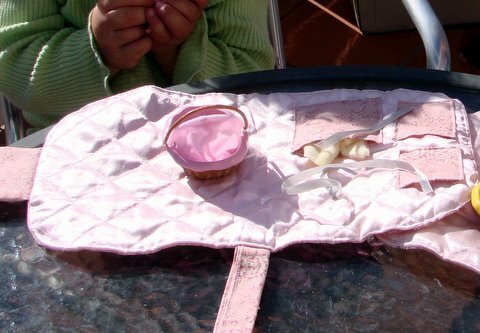 The idea is the baby dolls can have their nappies changed on the soft pink quilted fabric on the right and all their little bottles and accessories can be kept in the pockets. There's little ribbon to tie the carry cot or baby doll to. Cut out all the fabric pieces. Put the 2 bag pieces together. 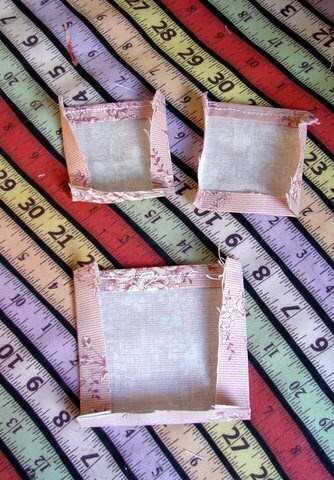 Fold them again so the fabric is in quarters and gently round off the corners on one side. Open out. You should have two oval shapes. Round off one edge of the bag closure pieces of fabric. Stitch the two pieces together, leaving the short straight edge open. Clip curves and turn right sides out. Press and stitch one half of the velcro to the curved end. Fold the handle strip in half lenghways and press. Open it out and fold the two long edges into the centre and press again. Fold the two folded edges together so they meet. Press and stitch close to the long edge. 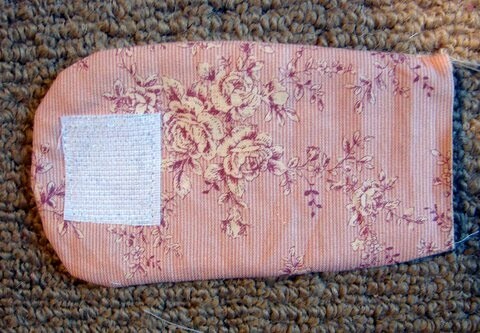 To make the pockets, fold over the top edge of the pocket strip twice, as if to hem it. Stitch. Cut the strip into three pieces. 1 x 10.5cm and 2 x 7.5cm. Cut 2cm off the bottom of the two smaller pieces so they measure 7.5cm x 7cm (or you can just make the pockets whatever size suits the toy you are making for. Fold in the two side edges and the bottom edge of each pocket and press. Mark the centre of the inside piece of your bag with a pin. 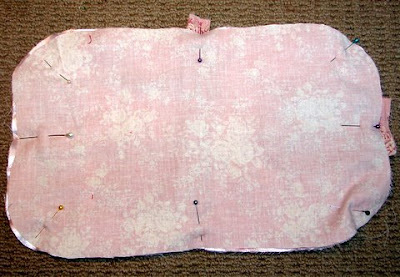 Pin the pockets and ribbon in place to the left of the centre mark and stitch. Pin the handle to the centre top of the bag so the raw edges overlap the raw edges of the bag. Do the same with the closure piece and stitch them both in place close to the edge. Now you need to attach the second piece of velcro. 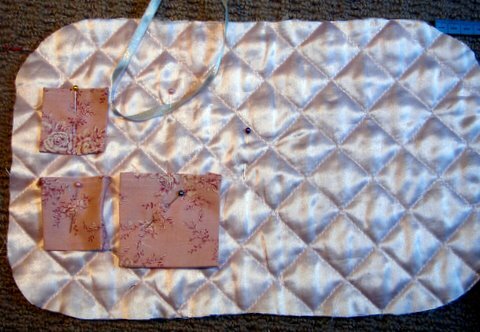 With wrong sides together, put the quilted piece together with the outer cotton piece and fold in half as if you are closing the bag. Fold the closure over the outside and marke where the velcro piece should go. Stitch the velcro to the outer cotton piece only in the marked position. Put both pieces right sides together, tucking the handle and closure inside, and pin. Stitch all the way around, leaving a 8cm opening for turning. Clip curves and turn right sides out. Poke all the edges out with your fingers or a chopstick. Pin the opening closed. Stitch close to the edge all the way around, catching and closing the turning opening. You're all done. Go and make a little girl very happy! There's no reason why you couldn't make a similar bag for a little boy to carry his cars or other treasures around in. 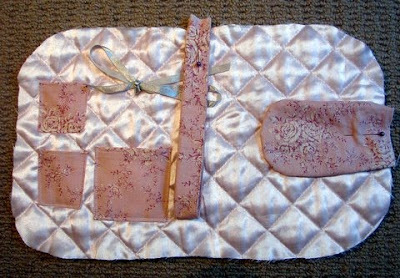 Iron stiff interfacing on to the inner piece of fabric rather than using quilted fabric. Let me know how you get on or if you have any problems with my instructions. How magic! Thank you for posting this. My little daughter will love one... I love the fabrics you chose, too. My youngest has the tiny dolls, and I too couldn't bring myself to spend so much money on the carrier. I assured her that I could make one at home, but so far haven't quite got around to it :-) So thank you for this, now I know what I can do if the weather turns rough this long weekend.